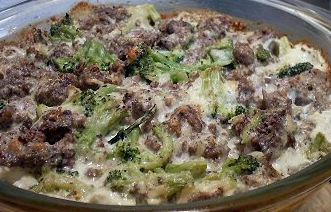 This time we will treat you to a nice Keto hamburger broccoli casserole that can easily be made. We recommend you to make according to recipe or maybe even a double set. Can easily be frozen down and heated up in either owen or microwave when needed. Ingredients are for 5 servings. Start with a large frying pan and fry the hamburgers until they are almost finished. Check out our guideline on how to do your own keto hamburgers. Also fry the onion together with the hamburgers. Add Salt and pepper according to your needs. Other spices can also be added if you want. Put the cream cheese in a bowl and heat it in the microwave for around 1 minute. It should get soft, then whisk it until it gets creamy and smooth. Now it is time to start adding the cream into the bowl with cream cheese. Whisk it all together until it is smooth. Add on the cheese and garlic and mix it all together. Add the keto hamburger and the broccoli in a casserole that is greased with butter. Pour the cream sauce over and make sure it all mixes together well. Add salt, pepper and other spices according to your liking. Put everything in the owen at 350 degree for around 40 minutes or until the top is starting to get brown. This entry was posted in Recipes on May 2, 2013 by Johan Bengtsson. This turkey burger recipe is very easy to make and also quite good. 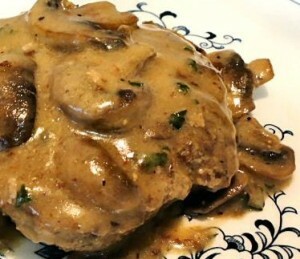 If you enjoy turkey burgers and mushroom this will be a treat for you. Fry the celery and onion in butter in a large pan for around 10 minutes. Combine all the ingredients in the burger recipe and create 5 pieces of burger patties. Heat up the pan to medium heat and add the oil or butter to fry the burger patties in. Place the patties in the pan and fry them for around 5 minutes per side. Use the same frying pan and add more butter. Fry the mushrooms until they are soft. Add the cream to the mushrooms. Add the salt, pepper and spices according to your taste. Once done, add the burger patties back on the frying pan and mix the mushrooms and cream over them. If you instead want to make a ground beef burger we recommend you to read our guide on how to make and cook keto burgers. 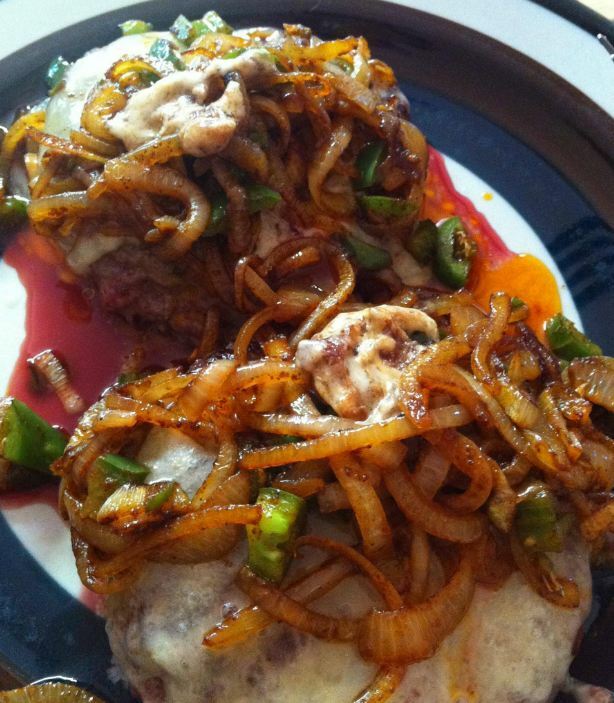 This entry was posted in Recipes and tagged turkey burgers with mushroom sauce on May 2, 2013 by Johan Bengtsson. Today we will talk about one of the favorite foods when starting out with Keto. It is also one of the food types that is easiest to get when out on most resturants. 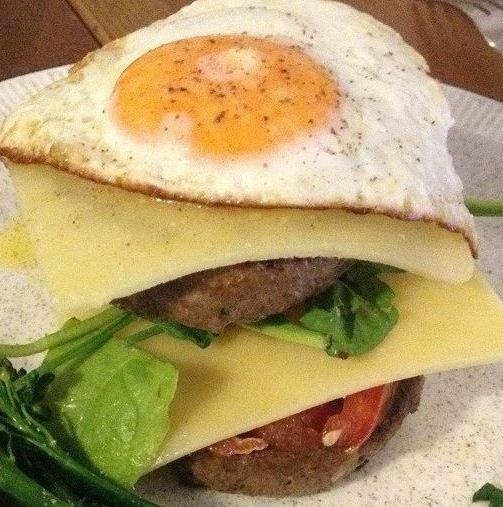 The Keto Burger, a burger that is high on fat and protein and low on carbohydrates. Enjoy these tips and ideas on how to make your keto burger and also the different pictures of keto burgers that people have made. One of the misstakes many people do when shaping their burger is to make it too thick. 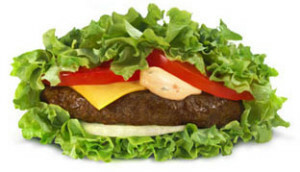 You should try to make the burger a little wider than normally and also make a small dimple in the center. You can use your thumb to press down the middle a little. The reason to make a small dimple in the middle of the burger is because it will rise more in the middle than in the sides. Store bought grounded beef for keto burger? You can either buy your ground beef in the store or you can make your own. If you have the time and tools for it make your own. It will always taste better and is more fresh. There is also a smaller chance to have bacteria in your meat. Always keep your burger meat cold when preparing it. All through the process when creating your keto burger you should keep the ground beef at a low temperature. Use a scale to weight your meat before you form your keto burger to make sure that all keto burgers get the same size. Do not overwork it when you are forming the burger. The more time you spend pressing the meat together the more you will also make the meat less juicy and tasty. Just gently press the meat together into small patties. Do not overwork it. There is no need to add other things to your meat when forming the patties, like egg, onion or herbs. If you do, then do it very carefully so you do not overwork the meat and loose that juice and tasty feeling of your keto burger. Do not add salt into your meat before you have created the burger patties. Salt will make the muscle proteins in the meat to dissolve. This will totally change both the taste and look of your keto burger. Use spices and make sure you always put enough spices on your burger before cooking it. You do not want to add on spices after it has been cooked. Salt and pepper is a must. You can of course also blend in other spices into your keto burger. I prefer to use chili powder and garlic to put a more strong taste in my burgers. Just select the spices you enjoy and try to experiment around a little to get the perfect taste for your keto burger. 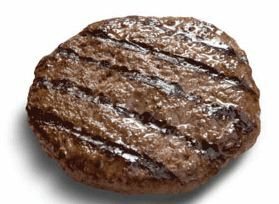 As you probably have heard many times, when cooking meat your should only flip it once while the burger is cooking. This rule does not apply to burgers. If you instead flip your burger several times when cooking you will have a faster and more even internal cooking of the burger. This will reduce the total time you spend on cooking your keto burger. It will also make the outside of the burger less burned. 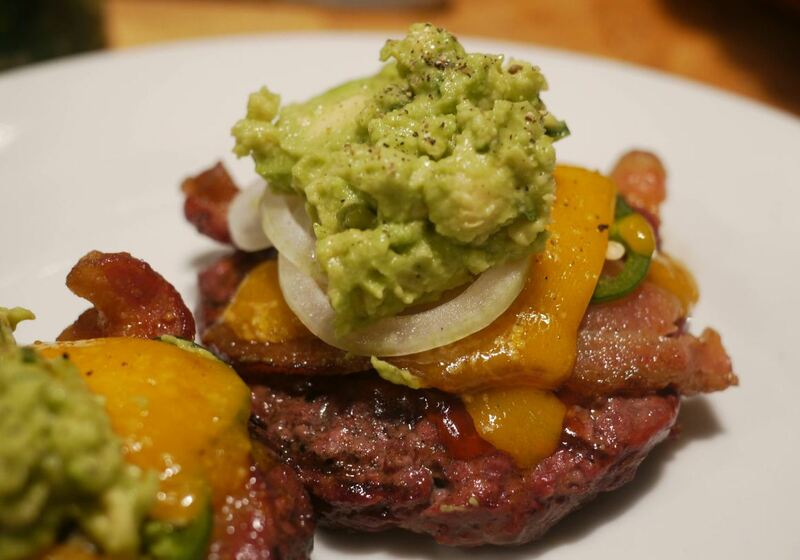 What ingredients you should put on your keto burger once it is finished is totally up to you. Experiment with what you think tastes good. 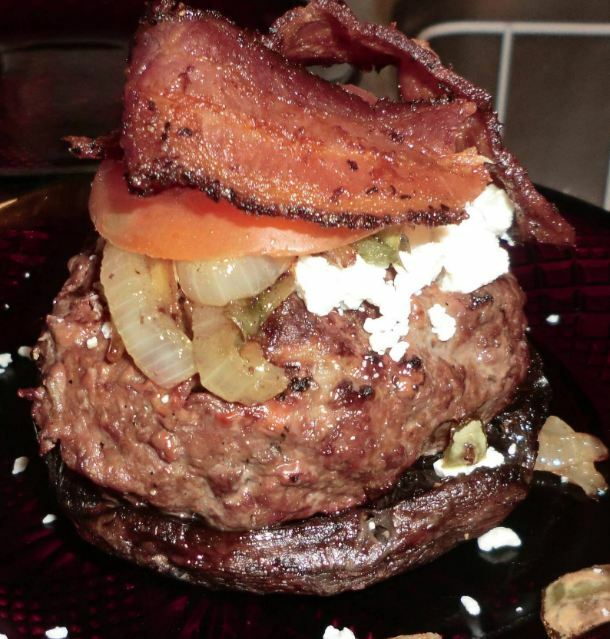 In general almost everything can go together with the keto burger. I personally like to put on things like fried egg, different kinds of cheese, bacon, jalapenos and other spicy stuff. When cooking your burger with different ingredients you can use this as guideline for how the fat, carbohyrate, protein ratio is. As you can see from below table the most common ingredients are very low on carbohydrates. As long as you do not add any bread to your burger you can add as much as you want of the below ingredients and enjoy a keto burger. In order to give you some ideas on how to make your keto burger and what different additional ingredients you should use I have put together a compilation of different keto friendly burgers. Now it is time for you to make your own keto burger. If you have tips on ingredients, how to make a keto burger or just a picture of your keto burger then please post it into the comments field and I will try to add it into the articles. 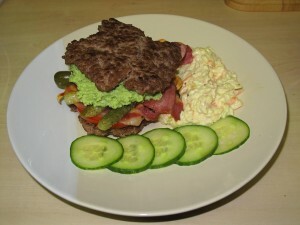 Keto burger with two beef patties, sallad, bacon, cheese, cucumber and egg. 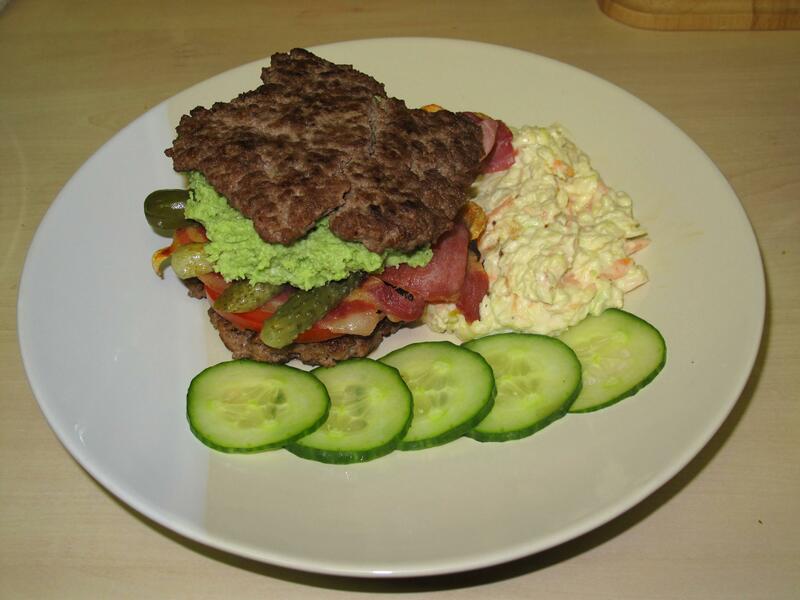 This entry was posted in Food, Recipes and tagged keto back burgers, keto bacon cheese burgers, keto burger recipe, keto burgers, keto cheese burgers, keto cheeseburgers, keto diet, keto ground beef, keto hamburger, keto hamburger recipe on May 1, 2013 by Johan Bengtsson. 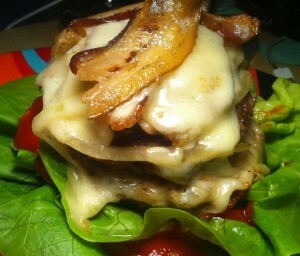 Keto Hamburgers or LCHF burgers are easy to make and contains very little carbohydrates. The bread you of course skip if you are strict with carbs but you can have many good accessories instead. Basically you just mix the minced meat with salt and pepper and other spices, but if you want you can add flavor to ground beef with garlic, mustard or whatever you have at home. The key is to make sure you have a fat, good sauce as an addition to the keto hamburger recipe. Mix all ingredients and process the mixture for a while. Shaping four burger patties and let them rest for a while in the fridge. See our guideline for making perfect keto hamburgers. Grill or fry for a few minutes on each side. Add a few slices good cheese to melt during cooking. This entry was posted in Recipes on April 27, 2013 by Johan Bengtsson. 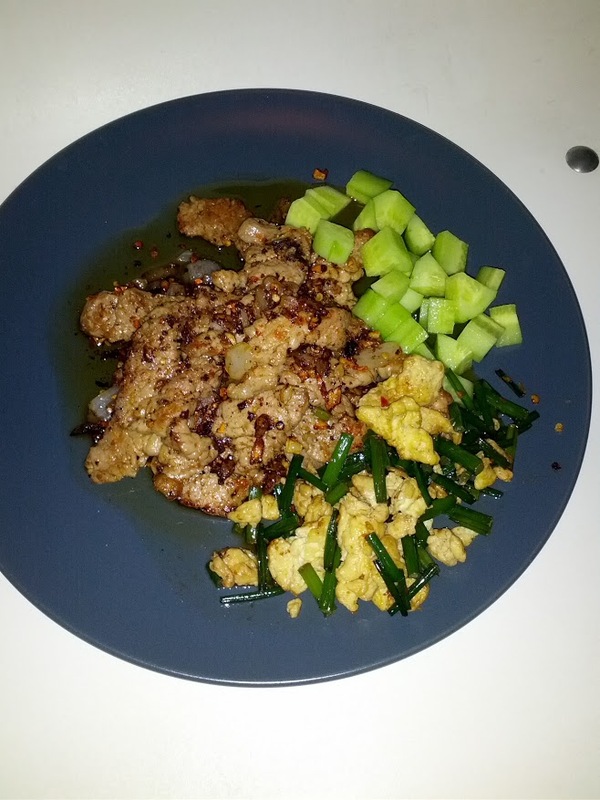 Todays food was pork with chili, some fried eggs and cucumber, everything swimming in olive oil and butter. The pork was cut into small pieces. Put the pork into a bowl together with some olive oil, chopped onion and plenty of garlic. Then add on some spices, like salt, pepper, chili powder and dried chili pepper. Mix everything together so the spices and oil gets all over the meat. Be careful if you do not like it too spicy, the oil will enhance the spicy taste. Start with a hot pan with some butter in. When the butter is hot add in the 2 eggs, fry together with the green vegetables untill it is done. Put it on a plate and let it rest there. Take the same pan and add a little more butter. Start putting down the meat into the pan and fry it all together untill it looks really nice and done. When you put it up on you plate make sure you get all the fat from the meat and butter also and put it on top of the meat as a nice sauce. Server with some cucumber that can help to get up all that fat on the plate. 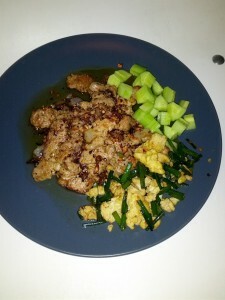 This entry was posted in Food, Recipes and tagged chili, diet, fat, food, keto, LCHF, pork on April 27, 2013 by Johan Bengtsson. This is a simple recipe for Keto Meatloaf. They taste wonderful and recommend everyone to try it out. Put everything into a bowl. If you would like to add extra spices of your own, now is the time. You can also throw some dill in, or paprika, or garlic – however the sausage does add a lot of flavor on its own. A) EASY MODE – – either with bare hands, or, as is my preference, with gloves on, dig in and mix that meat and cheese and egg up really good so everything is well mixed. B) HARD MODE – Same as above, but instead of using your hands, use a spoon or something to mix it. This will take longer. In a medium size baking dish form your Keto meatloaf – again, easiest with your hands, but its your loaf! Add a small amount of water (2-4 tablespoons) into the bottom of the baking dish – this keeps your pan from scorching and helps keep it moist. Place in a preheated oven @ 325-350 (When I make a thin loaf, I use the higher temp for quicker cooking – however if I am not in a rush i use the lower temp – if you make a thick/tall loaf, you need to lower the temp a bit to prevent overcooking the outside). NOTE:If you desire, you can also cook this covered with foil, or, in a roasting pan with lid – this will keep more moisture in, and keep the outside from crusting. Start checking your center mass temperature at about 30 minutes in, and every 5-10 minutes thereafter – center temp needs to reach 165 since there is pork in the loaf. Once you have reached temp, its done! Now just just have to enjoy your Keto meatloaf. This entry was posted in Recipes on April 26, 2013 by Johan Bengtsson. 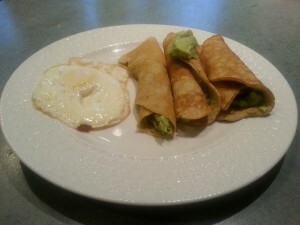 Some nice crepes with avocado filling to get you started today. Enjoy this recipe. Combine in food processor until thoroughly mixed. Rest in fridge overnight. Pan fry over medium high heat until underside is golden brown and delicious and the top side is mostly solid. Flip over and fry other side for 45 seconds. Enough heavy cream to thin to out to desired consistency. Combine in food processor until desired consistency is reached. Spread a thin layer over freshly cooked crepes and roll up. This entry was posted in Recipes and tagged avocado, crepes on April 25, 2013 by Johan Bengtsson. Here is a recipes of a good looking burger. Enjoy this burger recipes. Mix the cream cheese and the olives together to make an awesome filling between the two patties. Assembly the rest to your liking. This can definitely be tweaked. You do not need to follow this burger recipes exactly, create your own keto burger according to your liking and taste. 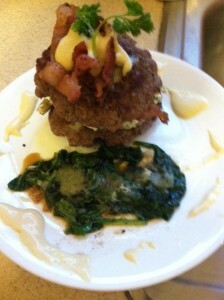 This entry was posted in Recipes and tagged Bacon, burger, Burger recipes, olives, spinach on April 25, 2013 by Johan Bengtsson.